You will be able to select 12 riders that will represent your startlist or team in a WorldTourcompetitie 2019 stage. You can select riders from all participating teams. You can do this through this website and, of course, before the deadline for each stage. These 12 riders will score you points (Or not, if you got the wrong riders), that score will be entered in the General Classification. Your scores will be added up and will result in the Stage competition’s general classification. As soon as you have more than 105 scores, your lesser results are deleted in the general classification. Only your 105 best results will be used to make up the classification. So, the more stages you enter, the more good scores will remain. Below your cycling team you'll see all the teams that were entered into the WorldTourcompetitie 2019. Beside each team the rider selection dropbox will show all the riders not yet selected into your team. The rider is now added to your team. Click on behind the rider you want to delete. That rider will be discarded from the team and put back into the selection section. You can also clean up your team with one click by clicking the link "Remove all riders from this team". Note: Untill the startlist is definitive the dropbox contains riders in black, those are the one that are prognosed to ride the WorldTourcompetitie 2019, and riders in grey, the riders that probably will not ride the WorldTourcompetitie 2019. As soon as the startlist is definitive you can only choose riders that are on the startlist. Please check your team shortly before the deadline if all riders you have selected will participate and replace the ones that don't. Only the individual rider’s scores will count in this classification. For each cyclist that’s on your startlist, you’ll get points if they are within the first 20 cyclists who cross the finishline. The number of points awarded depends on the ranking of your cyclist(s), which are listed below. All points earnt will form a stage-classification. 1st 50 extra, 2nd 40 extra, then 30, 20 and 10. Through the formula, the number of startlists entered will determine the number of points of 2nd place, all the way down to last place. When more than one player finish at the same placing, the scores will be split equally. Your scores will be added up and will result in the Stage competition’s general classification. 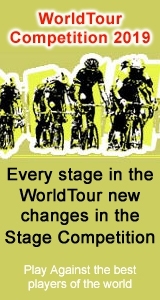 Whoever scores the most points during the Race, will win the WorldTourcompetitie 2019 StageCompetition.